Jean-Louis-Ernest Meissonier (1815–1891), The Siege of Paris (1870), oil on canvas, 53.5 x 70.5 cm, Musée d'Orsay, Paris. Wikimedia Commons. Following a series of disastrous defeats of the French Army, on 19 September 1870, Prussian forces had taken control of the country around Paris, and put the capital under siege. With the surrender of the French Emperor Napoleon III, a provisional republican government had been established, and ushered in the Third Republic as successor to the Second Empire – in the most difficult of circumstances. The new French government was not yet ready to admit defeat. They called for guerilla warfare against the occupying Prussian forces to deprive them of supplies, and the formation of large armies from the unoccupied provinces to the west and south. Prussian opinion favoured the bombardment of Paris to try to bring the war to a more rapid conclusion, but thankfully Prussian High Command wouldn’t accept that, on moral grounds. As the Prussians sent small armies out to the provinces to disrupt French attempts at re-organisation, conditions in Paris grew steadily worse. Anton von Werner (1843–1915), In the Troops’ Quarters Outside Paris (1894), oil on canvas, 120 x 158 cm, Alte Nationalgalerie, Berlin, Germany. Wikimedia Commons. 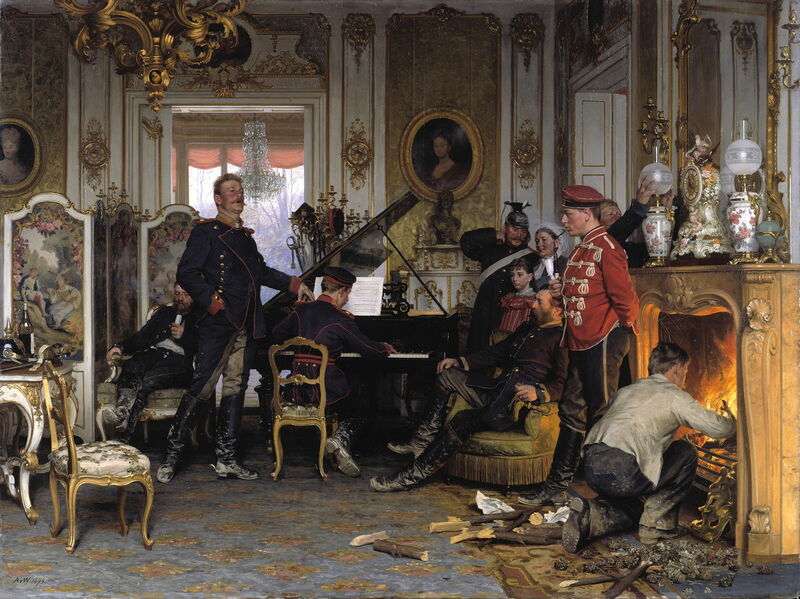 Anton von Werner shows the contrasting life In the Troops’ Quarters Outside Paris (1894), here in the luxurious Château de Brunoy, which had been abandoned to or requisitioned by those occupying forces. Prussian soldiers were blamed for the almost complete destruction of Pissarro’s work prior to the war, when they occupied his house in 1870. Édouard Detaille (1848–1912), Champigny, December 1870 (1879), oil on canvas, 121.9 x 218.4 cm, location not known. Wikimedia Commons. 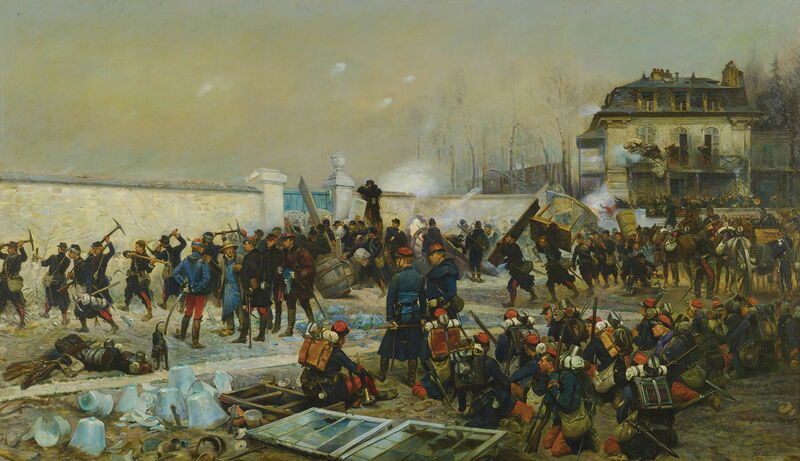 Édouard Detaille’s painting of action at Champigny, December 1870 (1879) is only 12.5 km (just under eight miles) from the centre of Paris. 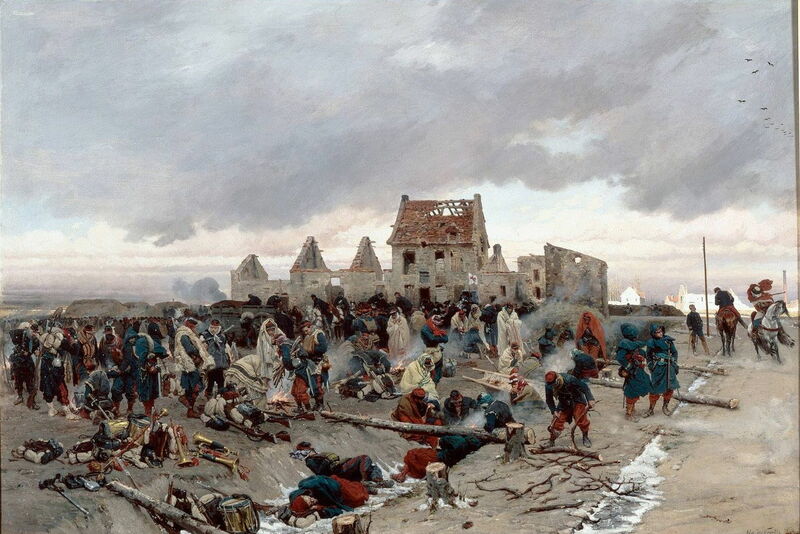 Alphonse-Marie-Adolphe de Neuville (1836–1885), Bivouac after the Battle of Bourget, 21 December 1870 (1873), media and dimensions not known, Musée d’Orsay, Paris. Wikimedia Commons. There were French counter-attacks. On 29 October 1870, General Carey de Bellemare attacked the Prussian Guard at Le Bourget, despite having no orders to do so, and forced them to cede the town to his troops. Although the Prussian positions were of little value to either side, the Prussians re-took them in the Battle of Le Bourget on 30 October. Although incorrectly dated, de Neuville shows French soldiers sheltering in a Bivouac after the Battle of Bourget, 21 December 1870 (1873). This was a major blow to the beleaguered citizens still in Paris. As the winter grew colder, Parisians were starting to starve. A city which had long been proud of its restaurants and food was reduced to scavenging meals based on horse, dog, cat, and even the city’s rats. Jean-Louis-Ernest Meissonier (1815–1891), The Siege of Paris (1870), oil on canvas, 53.5 x 70.5 cm, Musée d’Orsay, Paris. Wikimedia Commons. Jean-Louis-Ernest Meissonier’s romanticised view of The Siege of Paris from 1870 combines almost every symbol relevant to the city’s distress, dressing Marianne in a lionskin, against a battle-worn flag. Meissonier had originally been attached to the staff of Napoleon III, and accompanied him in early phases of the war in Italy. During the siege of Paris, though, he was a Colonel commanding an improvised infantry unit, and knew well the realities of combat. 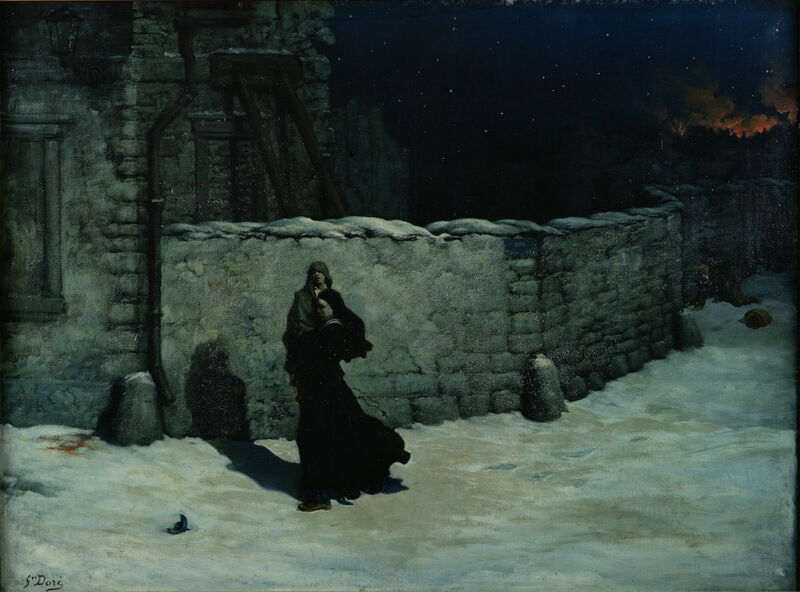 Gustave Doré (1832–1883), Sister of Charity Saving a Child. 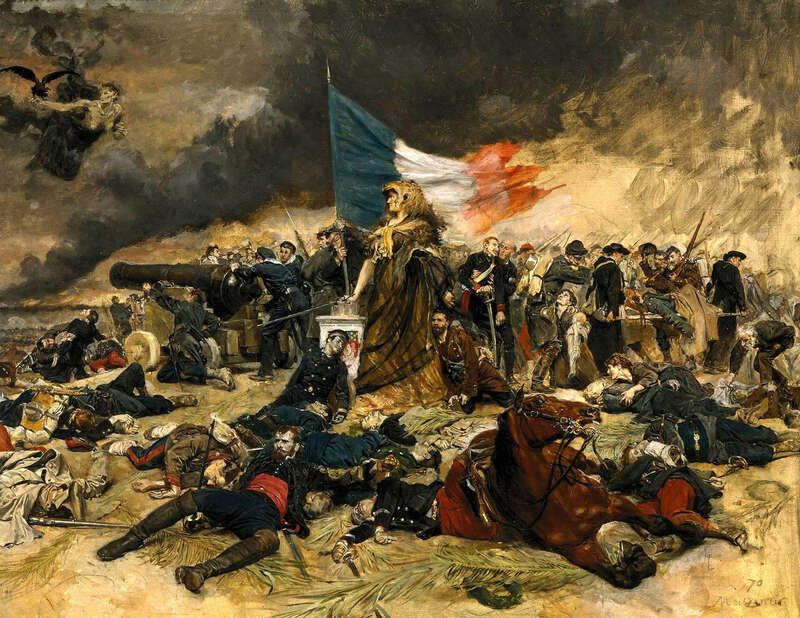 An Episode of the Siege of Paris (1870-71), oil on canvas, 97 x 130 cm, Musée Malraux (MuMa), Musée des Beaux-Arts, Le Havre, France. Wikimedia Commons. Another artist who was trapped within Paris was the great illustrator and painter Gustave Doré, who made several works showing scenes such as this Sister of Charity Saving a Child. An Episode of the Siege of Paris (1870-71). Louis-Ernest Barrias (1841-1905), The Defence of Paris (1883), sculpture cast in bronze, dimensions not known, La Défense, Paris. Image by Velvet, via Wikimedia Commons. 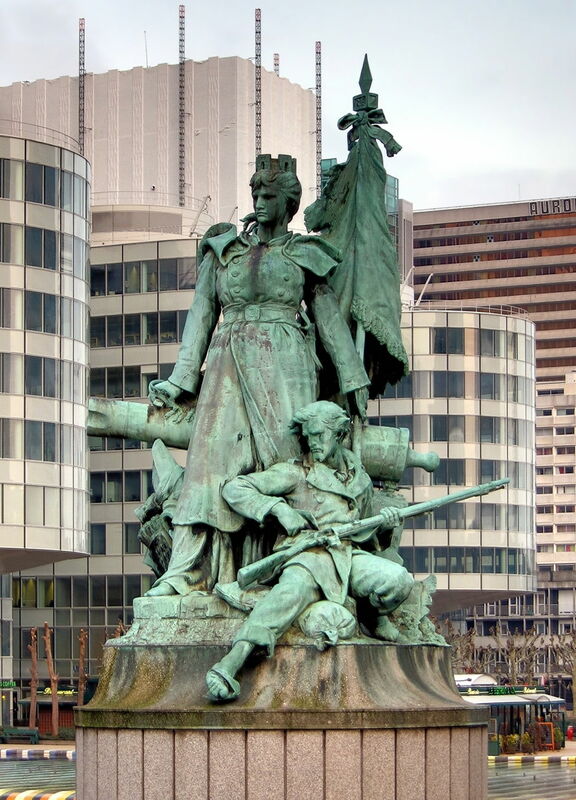 But the greatest memorial to those who lost their lives in the siege, and those who survived it, is Louis-Ernest Barrias’ bronze The Defence of Paris of 1883. This has so dominated the part of the city in which it is situated that the area is known as La Défense. Military action continued into 1871, although it was already clear that France was thoroughly defeated. Secret discussions about an armistice started on 23 January, but the French government feared that their capitulation could precipitate rebellion, even revolution. 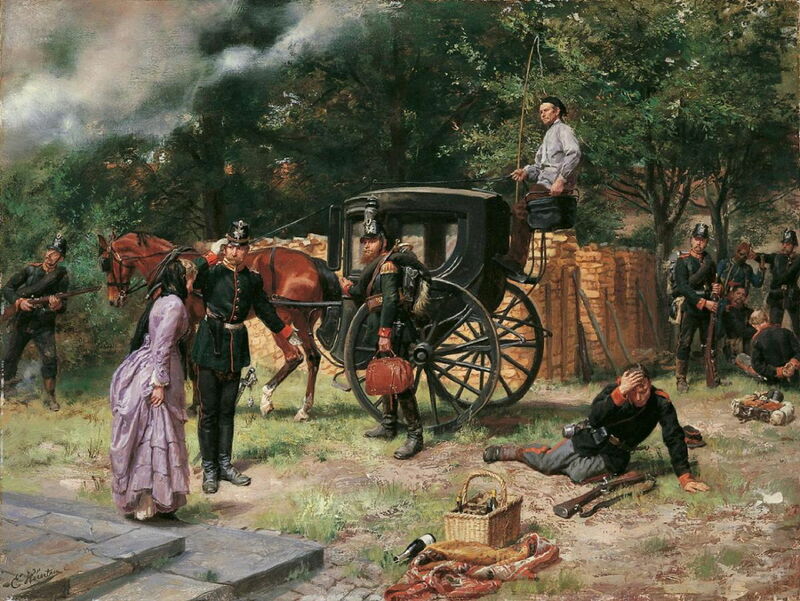 Édouard Detaille (1848–1912), The Armistice of 28th January 1871 (1873), media and dimensions not known, Deutsches Historisches Museum, Berlin, Germany. Wikimedia Commons. 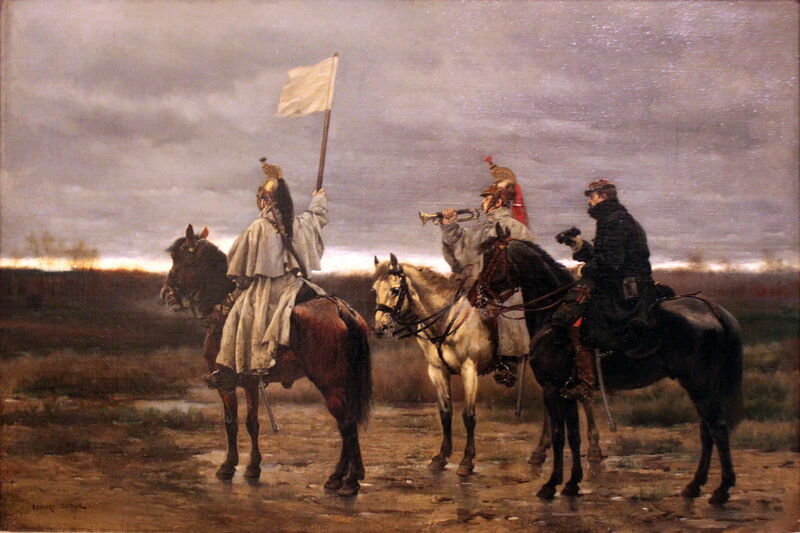 Édouard Detaille’s depiction of The Armistice of 28th January 1871 (1873) shows the moment that the symbolic white flag was raised, over a bleak plain. Anton von Werner (1843–1915), Crowning of Wilhelm I as Emperor of Germany, in Versailles (second version) (1882), media and dimensions not known, destroyed in World War 2. Wikimedia Commons. 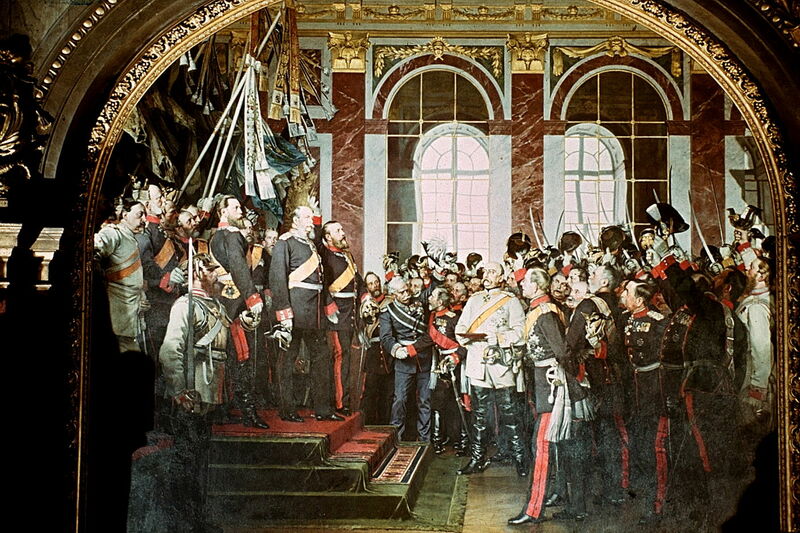 To the nearly 400,000 French dead from the war, the Prussians were determined to add profound insult: as shown in Anton von Werner’s painting of the Crowning of Wilhelm I as Emperor of Germany, in Versailles (1882), Prussia had celebrated victory and transformed into Germany in this ceremony held at the most famous of French royal palaces, on 18 January 1871. Emil Hünten (1827–1902), Welcome of Empress Eugénie by Prussian Soldiers (date not known), oil on canvas, 64.5 x 85 cm, location not known. Wikimedia Commons. With hostile crowds forming outside her Tuileries Palace, she slipped out to find sanctuary in the company of her American dentist, then fled to England by yacht on 7 September 1870. She was later joined by the former emperor, and the couple lived at Chislehurst in Kent. She never fraternised with Prussian soldiers. The Franco-Prussian War was over, but its effects on Paris were not yet complete. Posted in General, Life, Painting and tagged Barrias, de Neuville, Detaille, Doré, Hünten, Meissonier, narrative, painting, von Werner, war, war artist. Bookmark the permalink.